Appearance (0-20): A light brown wrapper is what wraps this cigar. Under closer examination, there are very small specks all over the wrapper…not bloom, but small bumps. The band was fairly simple, and nothing overly flashy. Pretty much a plain Jane look to it. Construction (0-20): The wrapper didn’t seem to come together very nicely, but it didn’t really affect the smoke. There were some noticeable veins as well while inspecting the smoke. The burn and draw were both acceptable for what I anticipated to be bad. Strength (0-20): I would say this was mild-medium in terms of strength. There wasn’t anything really building up during the smoke, and it’s pretty tame from start to finish. Flavor (0-20): The main flavors here were very earthy and woody. Cedar was very prevalent, but it really lacked any complexity. 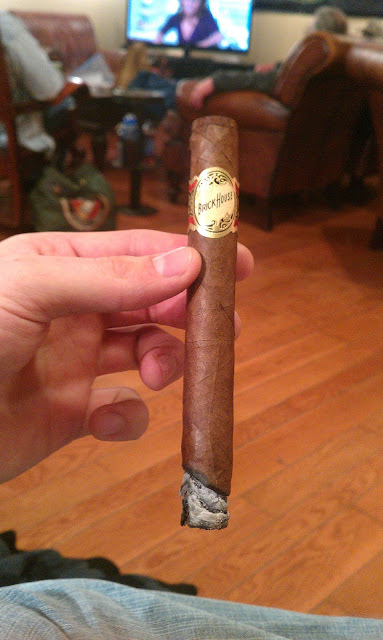 I had trouble finding an identity to this cigar, and it wasn’t enjoyable for me. Bland would be the best word to describe it. My brother once told me, “Once you start to not enjoy a cigar, it’s time to put it down.” After about the halfway point, I ended up giving up and put the cigar down. Value (0-20): I think the price is about right here. Not over priced to scare consumers away, but its priced right for someone who is looking for something mild or new to try. On the other hand, there are a few other cigars I could recommend for the same price. Additional Notes: Smoked at CI with a cup of coffee. Overall (0-100): I would like to give another try to the Brickhouse. I was kind of underwhelmed after hearing many good things about this. I definitely wouldn’t call it a “bad” cigar, but it was nothing to get excited about. Here’s to hoping my next one is better. If I end up going 0-2 next time, then I probably wouldn’t smoke it again.